Passing below the flyover carring traffic from I-25 south to I-225 north and RTD light rail bridges linking the H-Line and R-Line with the E-Line and F-Lines along Interstate 25 at Hampden South in Denver. The R-line runs northward along nearly the entire length of Interstate 225 to Peoria Station. Photo taken 08/11/16. The lone branch route from Interstate 25, I-225 constitutes a commuter freeway from Hampden South in Denver to Aurora. The loop joins Interstate 25 north from Greenwood Village to Interstate 70 east by Pena Boulevard to Denver International Airport (DEN). I-225 passes by Cherry Creek Reservoir / State Park and Aurora Mall in Arapahoe County and the University of Colorado Anschutz Medical Campus in Adams County. Interstate 225 was historically the main southeastern bypass, but a second bypass freeway was created with the completion of the E-470 Toll Highway. The area along Interstate 225 was originally not developed, but as population grew and new housing developments were constructed, I-225 became a busy corridor. 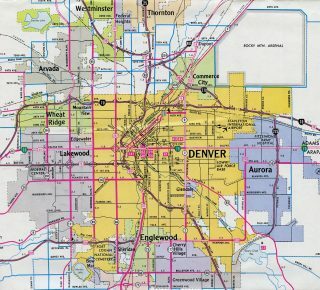 Additionally, business travelers use I-225 and Colorado E-470 as the most direct route from the Denver International Airport (DEN) to the Denver Tech Center. Undated map of Denver showing Interstate 225 south from Yale Avenue. 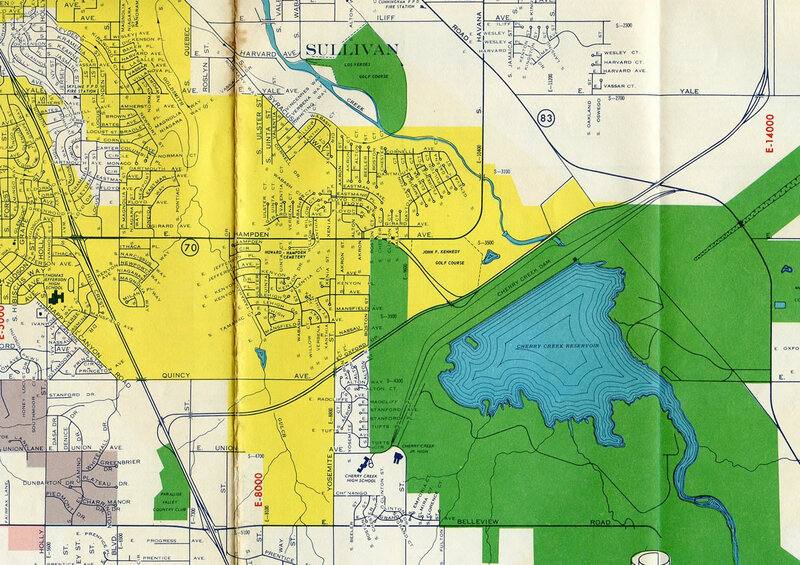 The initial design for Interstate 225 at south Denver included an access road from the freeway near Cherry Creek Reservoir to Hampden Avenue (old U.S. 285) and a simple wye to I-25 south and from I-25 north. Interstate 225 extended south to Colorado 83 (Parker Road) by September 1971. A directional T-interchange joined the freeway with I-70 at the north end. The southernmost portion of Interstate 225 was incorporated in the greater Denver “T-REX” construction project. The $1.72 billion project expanded both Interstates 25 and 225 with additional lanes and light rail corridors. Work along I-225 widened the freeway to six lanes from I-25 north to SH 83 and reconstructed the interchange with Interstate 25.2 The overall six-year project was completed by late 2006. A collector distributor roadway from 17th Place returns to Interstate 225 north one mile south of Interstate 70. The six lane freeway crosses Sand Creek ahead. Photo taken 08/11/16. Traffic separates into a three lane ramp for Interstate 70 west to the Montbello and Stapleton areas of Denver and east and a two lane exit for Interstate 70 east to Denver International Airport (DEN), east Aurora and Bennett. Photo taken 08/11/16. The original directional T interchange with Interstate 70 was redesigned to eliminate left-hand ramps. Flyovers for Exits 12A/B were built during the construction from 1994 to 1998.1 Photo taken 08/11/16. Exit 282 breaks away from the westbound mainline of Interstate 70 as a collector distributor roadway for both I-225 south and Pecos Street. The c/d roadway departs just after traffic merges from Pena Boulevard south. Photo taken by Dale Sanderson (05/01). 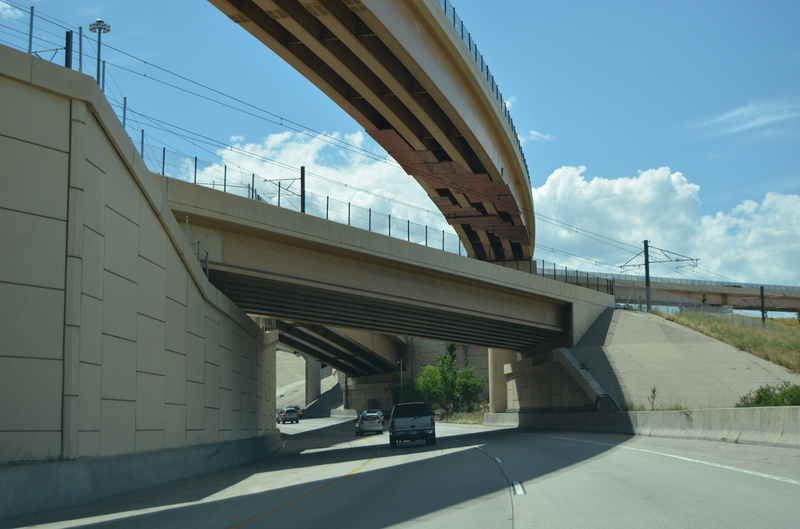 The high speed flyover for Interstate 225 south peels away from the c/d roadway to Peoria Street. Upgrades to this interchange were made when Denver International Airport (DEN) and Pena Boulevard, its access freeway, were built. Pena Boulevard is named for former Denver Mayor Federico Pena, who was in office during the construction of the airport. Pena went on to be a transportation secretary for former President Bill Clinton. Photo taken 08/11/16. The initial sign for Interstate 225 south (Exit 282) appears at the Havana Street underpass. A $25 million project underway in May 2015 replaced the I-70 bridges over Havana Street here, made ramp and lighting improvements, and constructed a tunnel for the railroad adjacent to Havana Street. Photo taken 08/11/16. The succeeding exit joins Interstate 70 east with Peoria Street and the Stapleton industrial area. Interstate 225 south follows in one mile. Photo taken 08/11/16. Three lanes serve commuter traffic headed south onto Interstate 225 through Aurora. Photo taken 08/11/16. 2016 sign changes made at Exit 282 on I-70 east removed the Chambers Road overhead and replaced the panel for I-225 to show three lanes. Photo taken by Dale Sanderson (05/01). The first guide sign for Interstate 25 appears by Dayton Station, 1.5 miles out. The R-line light rail runs between the travel lanes of I-225 southward from SH 83 to the southern terminus. Photo taken 08/11/16. Interstate 225 turns westward to cross over Quincy Avenue and DTC Boulevard on the half mile approach to Exits 1A/B with I-25. 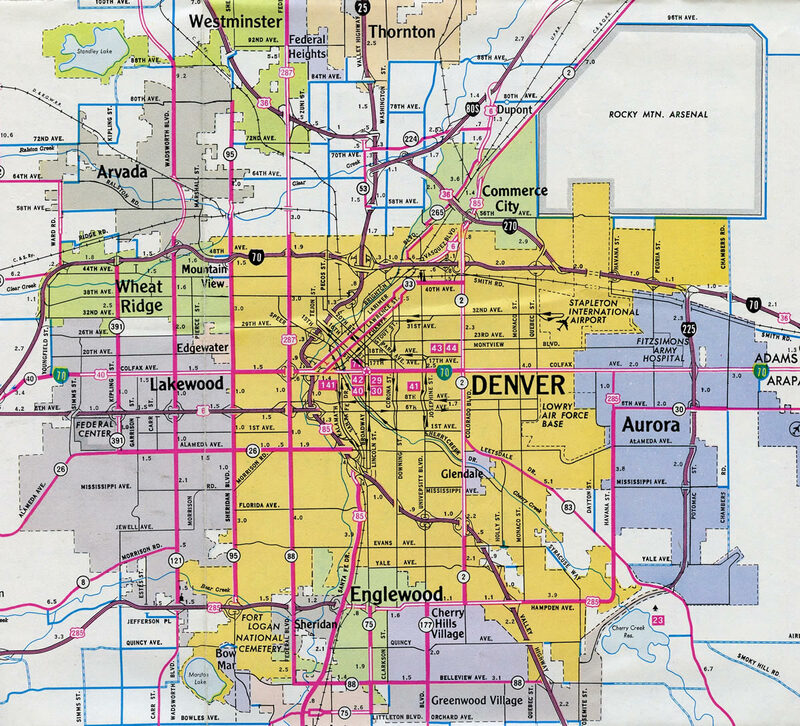 Denver Tech Center lies to the south. Photo taken 08/11/16. Exits 1A/B separate for Interstate 25 north to University Hills, Baker and Downtown Denver and south for Greenwood Village, Centennial and Lone Tree. The southbound on-ramp utilizes a tunnel below the Interstate 25 mainline. Photo taken 08/11/16. The roadways of Interstate 25 previously separated through the directional T interchange (Exit 199) with Interstate 225 to accommodate left-hand ramps for the southbound lanes. TREX construction realigned the mainline so that north and southbound traffic travels side by side, with new distributor roadways added for the adjacent interchange with Colorado 88 (Belleview Avenue). Photo taken by Dale Sanderson (04/01). Exit 199 departed from I-25 north for Interstate 225 east to the city of Aurora. This ramp now joins a distributor roadway from SH 88 north. Photo taken by Dale Sanderson (04/01). Prior to the reconstruction of Exit 200 during the TREX Project, a left-hand ramp departed from Interstate 25 south for I-225 north to Aurora. The new ramp separates from the southbound mainline further north. Photo taken by Dale Sanderson (04/01). Interstate 225 – 50th Anniversary of the Interstate System. Colorado Department of Transportation (CDOT). "T-REX Project Fact Book." Colorado Department of Transportation, January 2002.